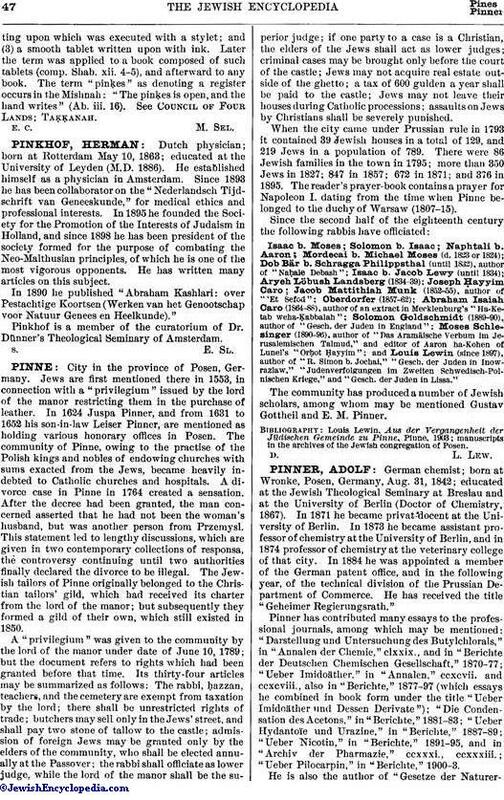 German chemist; born at Wronke, Posen, Germany, Aug. 31, 1842; educated at the Jewish Theological Seminary at Breslau and at the University of Berlin (Doctor of Chemistry, 1867). In 1871 he became privat-docent at the University of Berlin. In 1873 he became assistant professor of chemistry at the University of Berlin, and in 1874 professor of chemistry at the veterinary college of that city. In 1884 he was appointed a member of the German patent office, and in the following year, of the technical division of the Prussian Department of Commerce. He has received the title "Geheimer Regierungsrath." 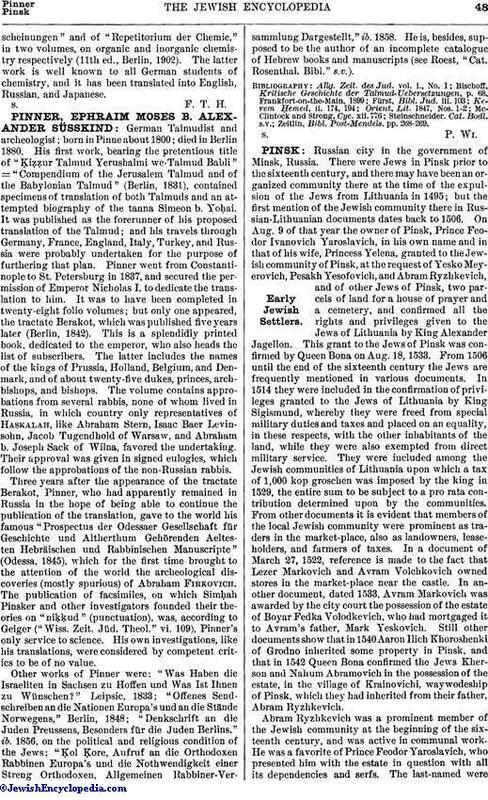 Pinner has contributed many essays to the professional journals, among which may be mentioned: "Darstellung und Untersuchung des Butylchlorals," in "Annalen der Chemie," clxxix., and in "Berichte der Deutschen Chemischen Gesellschaft," 1870-77; "Ueber Imidoäther." in "Annalen," ccxcvii. and ccxcviii., also in "Berichte," 1877-97 (which essays he combined in book form under the title "Ueber Imidoäther und Dessen Derivate"); "Die Condensation des Acetons," in "Berichte," 1881-83; "Ueber Hydantoïe und Urazine," in "Berichte," 1887-89; "Ueber Nicotin," in "Berichte," 1891-95, and in "Archiv der Pharmazie," ccxxxi., ccxxxiii. ; "Ueber Pilocarpin," in "Berichte," 1900-3. He is also the author of "Gesetze der Naturerscheinungen"and of "Repetitorium der Chemie," in two volumes, on organic and inorganic chemistry respectively (11th ed., Berlin, 1902). The latter work is well known to all German students of chemistry, and it has been translated into English, Russian, and Japanese.